We were very lucky to have Jennifer Murray visit the school today. Jennifer circumnavigated the globe aboard a helicopter, the distance of 36,000 miles in 97 days in 2000. She earned the Guinness World Record for the first helicopter circumnavigation by a woman. Following this challenge, she thought she’d push herself again. 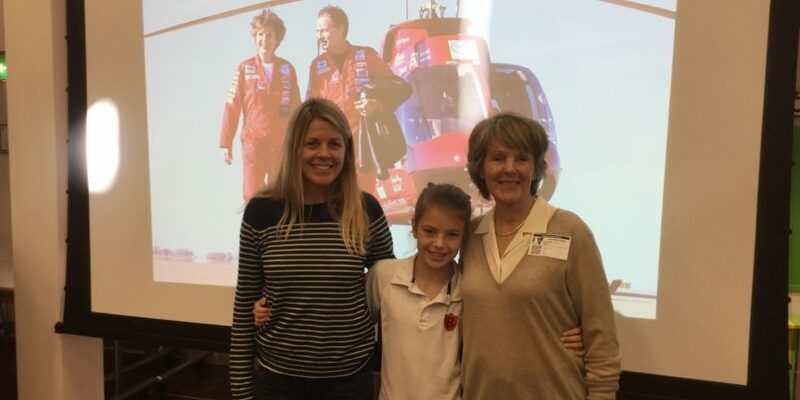 In 2007, Jennifer successfully co-piloted a helicopter circumnavigation of the Earth by the north and south poles with pilot and friend, Colin. Their first attempt in 2003 ended in a crash in Antarctica, where both pilots were badly injured, so it was extremely brave of them to try again only four years later. Their 171-day expedition saw them fly over 32,000 nautical miles (60,000km) through 26 countries. Both pilots noticed the impact of climate change, saying that much of the bad weather they encountered was attributable to global warming. When they landed on the northern tip of the Antarctic Peninsula it was bare of snow. The expedition raised money for SOS Children’s Villages, a charity which helps orphans. Not only is Jennifer extremely inspirational, making us all want to embark on an adventure of our own, she’s an author of three books and an avid artist, drawing for her daughter Christy. She is also Carla’s (year 6) grandmother! We are very grateful for Jennifer taking the time out of her busy schedule to visit us, thank you!